The majority of the engine bracket is removed in this photo. The SS horizontal bar comes off by removing two 3/8” bolts. The swing arm and diagonal has already been removed via a single 1/2” bolt. The whole process takes 10 minutes. Of course, there are techniques we can use to maneuver her into and out of her slip without an engine. In little to no wind or cross current we can scull her into and out of her slip with our 14’ 10” long sculling oar. We have done it a number of times. It’s a very satisfying thing to accomplish. Given the right conditions, sculling is my preferred method of moving the Far Reach when there is little wind or the maneuvering space is too restricted to sail. We can also warp her in, using an anchor and some long lines. Warping provides lots of control but requires lots of work. Our new wider slip is not aligned with the current so we almost always have a difficult cross current. This summer we sounded some adjacent areas around the marina’s docks to see if there is enough depth to anchor nearby (the idea being if there was too much wind or current to get back into the slip—getting out is relatively easy—we would anchor and then enter the slip when the wind or current died). The answer is a qualified yes. If the wind-driven tide is up we have enough depth to anchor about 100’-150’ from our slip. If the tide is out, not so much. So, the outboard remains a useful tool for us. Throughout the six year rebuild of the Far Reach I thought a lot about the pros and cons of sailing the Far Reach without an inboard diesel engine. Due to the particulars of where we live it was evident that we would occasionally need the ability to power the Far Reach. A small outboard looked like a good solution but we would need a way to attach it to the boat. I looked at all kinds of designs over the years. I sketched ideas. I discussed it with friends. I did not want to bolt anything to the lovely transom of the Far Reach. I wanted a simple yet elegant way to attach an outboard engine. It had to be removable but it also had to work. I could not find a design that met my criteria. Then, I ran across an entry on the website for Cape Horn Marine Products, makers of the Cape Horn Windvane. Yves Gélinas, designer and builder of the Cape Horn Windvane—which we also use on the Far Reach—describes in the article the custom engine mount he installed on his legendary Alberg 30, Jean-du-Sud. It looked like a clever design. It was not on the transom. It was robust. It was designed and built by an offshore sailor that uses it on his own boat. I asked Yves if he could build one for the Far Reach. The engine bracket is not a product they offer. So, Yves had to think about it for a while. Lucky for us, he said yes. Yves guided me through the design process via a number of emails. He advised me on how high the engine mount needed to remain above the surface of the water and how much shaft needed to be in the water. The bulwarks on the Far Reach precluded using the same attachment method Yves used on Jean-du-Sud. Together we developed a way to attach his engine bracket design to the Far Reach. Then, I designed our attachment hardware and my best friend welded up the few bronze parts required. The length of the horizontal bar is equal to the length of rotating arm between the two pivots points. The motor pad pivots on a long arm bolted perpendicular to the vertical rotating arm. The engine bracket attaches to our bronze hardware with just three bolts and can be removed in 10 minutes. It has worked flawlessly for 2 1/2 years. The quality of workmanship in the engine bracket fabrication and welding is the same high quality as in the Cape Horn Windvane—thanks Éric Sicotte. The design of the mount incorporates a SS rotating arm and a long diagonal support tube. In the down position the shaft of the engine is deep in the water. In the up position the shaft and propeller are completely clear of the water even when heeled at maximum angle. The bracket is deceptively strong. I sailed all the way home to NC from Sint Maarten in the West Indies with the engine mounted on the bracket in the up position without the slightest problem. We are in the midst of making a minor adjustment to the weld angle so the outboard will not be tipped up as much when stowed. The engine remains clear of the water even when heeled over 30°. Another nice feature of the engine bracket is the outboard engine can be slightly adjusted left to right and locked when we are underway to steer a perfectly straight line countering prop walk. Still another feature is the engine can be steered left to right when maneuvering at slow speed which acts like a steerable thruster. Very handy. The mount is exceptionally strong. 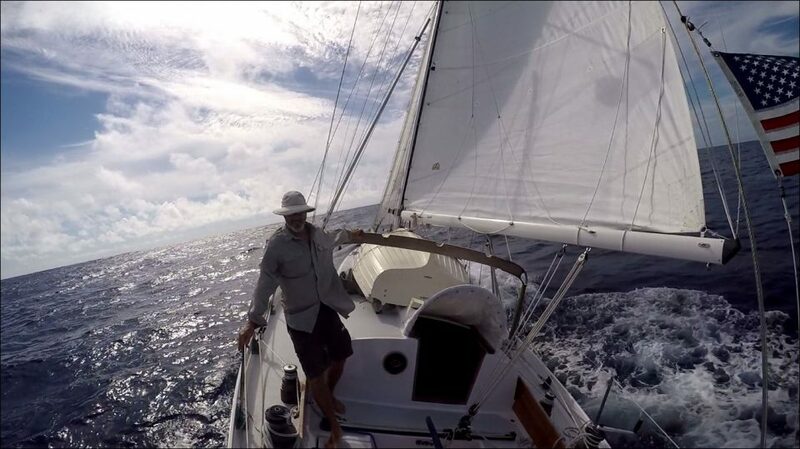 I sailed home 1300 nm from St Maarten to NC, via the offshore route, with the 112 lb outboard mounted to the bracket, in the up position, without any trouble. The engine we removed was a 500 lb 40 hp diesel inboard. Everyone told us it would be nuts to remove the inboard and even more nuts to think we could move our 9 ton sailboat with anything less than a 25 hp engine. But I had sailed on my friend Ben Zartman’s 20,000 lb cutter Ganymede and seen first hand the performance of the 8 hp Yamaha High Thrust outboard he uses as an auxiliary engine. I was confident a similar sized engine would work equally well on the Far Reach. The performance of the 9.9 Honda Power-Thrust outboard we purchased has been impressive. The Power Thrust is Honda’s answer to the Yamaha “High-Thrust” outboard engine. Both engines use a higher ratio reduction gear and a larger diameter slower turning four blade propeller to produce more thrust than a standard outboard. Yamaha no longer makes a 25” shaft High Thrust outboard with a pull start. I did not want an electric start engine. So, we purchased the Honda. At wide open throttle this little engine will push the fully loaded 18,500 lb Far Reach an impressive 5.9 knots on smooth water. At 3/4 throttle we manage about 5 knots. At half throttle we average about 4.25-4.5 kts. True enough, the speed drops off as the wind or chop increases. And the engine can’t usually be used if there are big swells or steep chop as it is susceptible to getting flooded under such conditions. The trade off is we have a lot of room in the Far Reach we would not have if we had an inboard diesel and all the supporting systems and “stuff” it requires to operate. There is no inboard engine under the cockpit sole. The old engine space is 7’ long 30” high and nearly 3’ wide. It’s completely available to us for storage. Underneath that huge open space we now store three spare anchors and chain. We removed a 50 gallon fuel tank from the bilge. We now have three water tanks there that hold a combined 70 gallons plus another 20 gallon tank in the port cockpit locker. That, in turn, opened up a tremendous amount of space under the settees and forward double and quarter berth where water tanks were originally located. Originally, the engine compartment was immediately behind the companionway ladder. When we gutted and rebuilt the Far Reach we removed the engine and created in its place a large storage area. The boat feels bigger inside and smells better too. The amount of storage space gained was significant. Eliminating the engine also freed up the bilge because we also removed the supporting fuel tank. There were cascading benefits caused by removing the engine—more storage space, less weight, less maintenance, less complexity. This photo does not adequately depict the space available where the engine had been. Under the walnut sole we now store three large anchors in dedicated racks. We also store spare anchor chain, anchor shackles, our storm drogue, and 230 lbs of lead pigs to compensate for the engines weight. Because the weight is several feet lower than the engine the boat is stiffer. By removing the inboard we also eliminated through-hulls, a prop shaft, propeller, stuffing box, fuel and water strainers, two batteries, and all kinds of wiring. There is now less requirement for specialized tools, spare parts, or the expense that goes with them. Without the propeller we were able to close-in and fair the propeller aperture which gained us a lot of improved performance under sail in terms of speed and maneuverability. And there is no diesel smell on the Far Reach. Without the closed-in engine space the interior air circulates better and the cabin feels larger. So, for now it’s been a worthwhile compromise. And that brings me to another advantage of our current set up. With freezing weather upon us it was time to winterize the auxiliary. What was required? Very little. I took the engine off and took it home. Done! I used the marina raft to come along side the Far Reach and lifted the engine off the engine bracket and transported it over to the sea wall and then into the truck. I have also transferred the engine with our 9’ Fatty Knees hard dinghy, an inflatable, and a 19’ fishing skiff. I want one. I must have one. Thank you for sharing.